"Marlies is a true professional who has a passion for what she does. She addressed all our wants and needs to give us a one-of-a-kind design that went beyond our expectations." 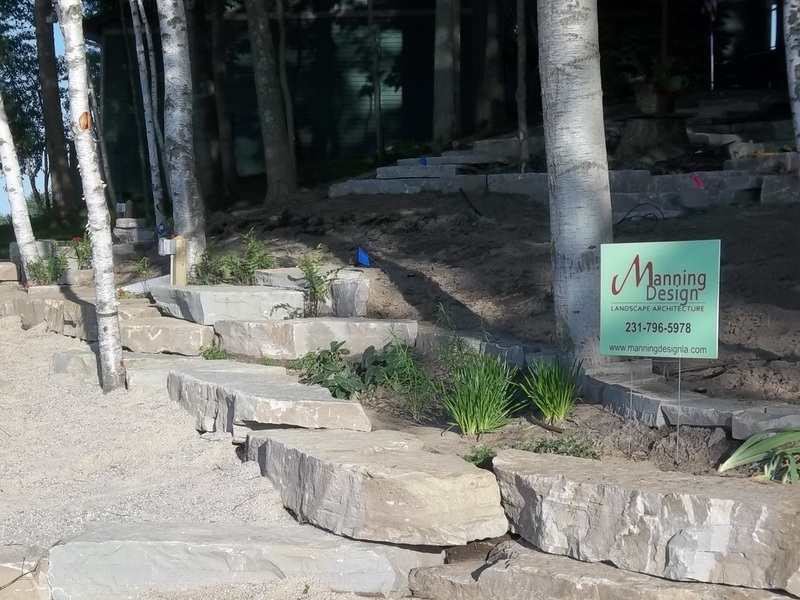 Whether you need help with one corner of your yard or a Master Plan for your entire yard, Marlies Manning offers the experience and expertise of a landscape architect to solve your problem. My services range from an hourly landscape consultation to detailed master planning and design-build service. By listening closely to your needs and ideas, Marlies will create a master plan for your yard that you can implement or Marlies will assist in coordinating installation with a trusted contractor. Marlies Manning is a certified Natural Shoreline Professional. 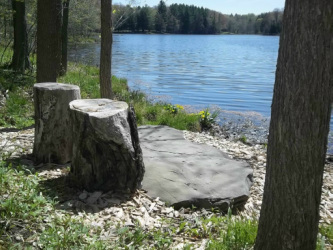 Ms. Manning has been trained in principles of natural landscaping and erosion control on inland lakes. 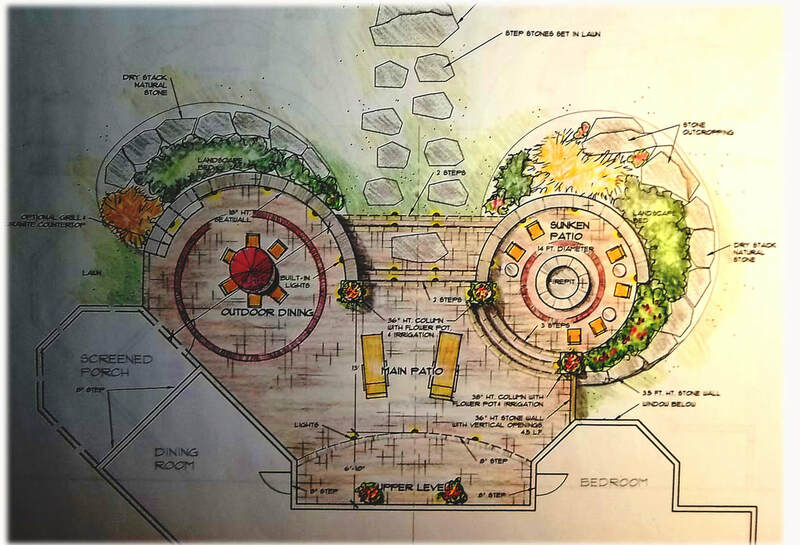 Master Plans include detailed design, custom design elements, and planting plans (if requested). Marlies listens to your needs, interprets your vision, and will facilitate construction with a trusted contractor. This residential project was part of a house renovation project. The new entry way was designed to draw attention to the steps leading to the front door. The stone plinths create a gracious, yet rustic, entryway. They also serve to illuminate the stone patio with light sconces. 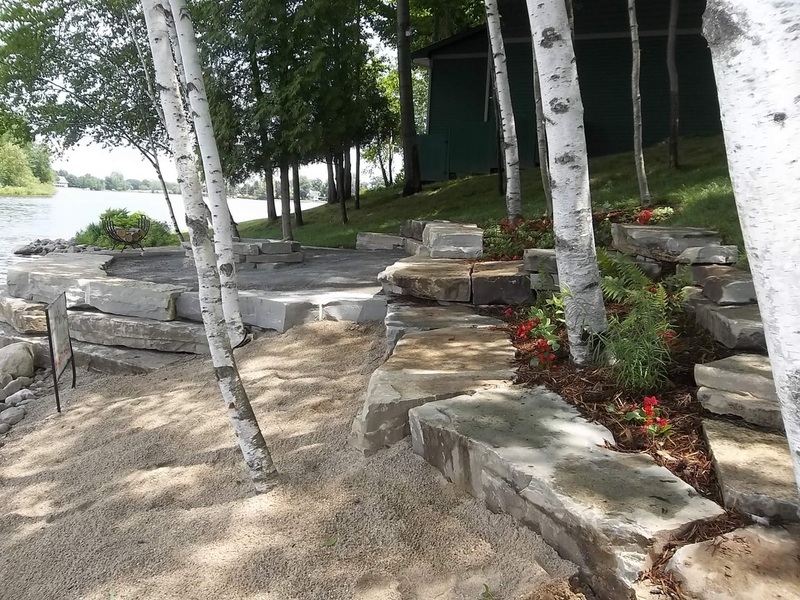 This project also included constructing a pond, stone paths, patios, reinforced turf driveway, moving a garage, boat launch, and extensive landscaping. The project began in 2015 with a Landscape Master Plan. Construction was completed in 2016. "This past summer our family had the pleasure of working with Marlies who made our dreams become a reality! 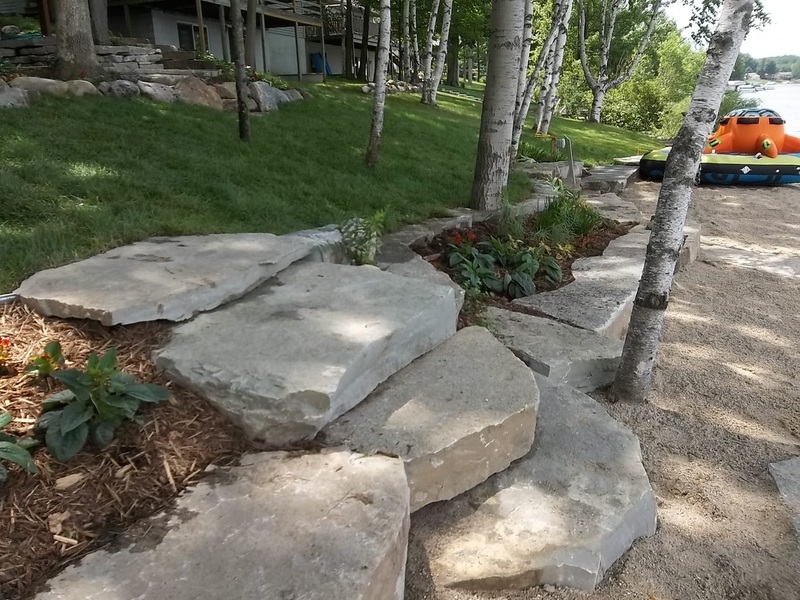 The weather was not very accommodating to completing such a detailed landscaping project, but despite all the adversities, Marlies was able to keep the project moving forward and accomplished it beautifully the week before our daughter's wedding. She treated the project as if it were her own, and was consistently updating us on the project's status. She just wasn't a design architect after the project was completed, she became our friend. The wedding day was perfect and all of our family and friends admired our unbelievable landscaping! As our family sits at the awesome fire pit on the water's edge, we get a thumbs up from all of the boaters who pass by! Thanks to Marlies we will have many more happy memories at Canadian Lakes!" 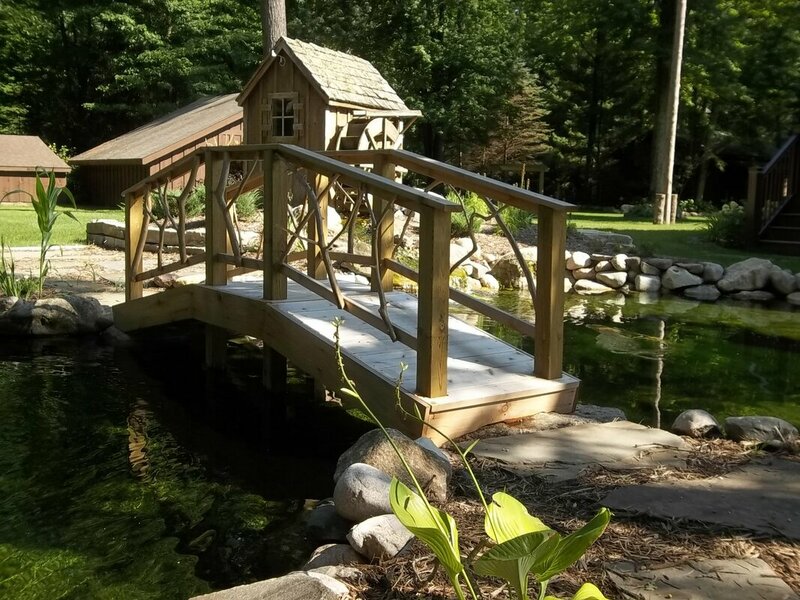 The homeowners acquired a beautiful piece of wooded property adjacent to their home on a small lake. Their vision was to create a path through the woods and a couple of sitting areas. 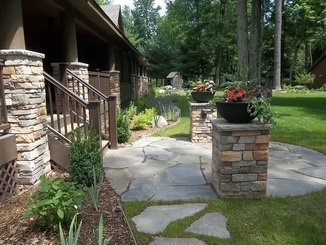 Manning Design prepared a master plan that included a walking trail, natural stone overlooks (shown), rustic stone bridges, dry creek beds, fern beds, a stone cairn, and a fire pit. Manning Design coordinated and supervised the installation of the plan. "I just wanted to tell you how happy we are with the project. It really turned out more beautiful than we even imagined". Shirlee S.
"The stone bridges are gorgeous- but they also look like they belong there. Same with the dry creek bed stones. You enhanced the accessibility, without diminishing the integrity of the space. I love the way the stones used for the bridges are different from one another, and yet fit the site. I love that the paths meander, and intersect with the creek beds. In a strange way it reminds me of a meditative walk- a deconstructed mandala. The path leading to the water kills me- how would you ever leave that spot? I love the split in the creek bed; that's what happens in real life. The overall effect is so coherent and lovely". Myriam. The homeowner requested a design for a barrier-free backyard. Design-build project included a new deck and ramp, concrete walk, landscaping, a brick patio installation and irrigation. Done! The homeowner is able to enjoy her backyard and the view of the river from her wheelchair. "We were looking for something unique, and a design that would be barrier-free for my wife. The design could not have worked better. My wife is confined to a wheelchair and has not been able to access our backyard in four years. We had a family reunion at our house this summer. My wife was able to spend most the weekend out on the patio, allowing her to be a part of all the activities. The landscaping, the attention to details, the thought behind the design has made our backyard beautiful and usable. Fantastic!" Ted S.
"Thanks to Marlies Manning of Manning Design... she did an incredible job of bringing my landscape design vision to something tangible. Now it's on paper. Next step... bringing it to life! Marlies is incredible to work with... creative, listens well and able to capture the essence of what you desire; talented, honest, timely and beautiful. How can you beat that??!!!" "We hired Marlies for a landscape consultation. Marlies drew out plans for our front entry design that we never would have come up with. Not only was she there to answer my abundance of questions, but she came a second time to decorously lay out the plans in detail. I highly recommend her to any and everyone that needs a little nudge and encouragement with making their property the best they can."